In the beginning, this page was dedicated just to the map. But after an exchange of emails between Lindsay Shields, a Flushing High School drama and english teacher who wants to use Jitterbug! in her classroom and perform scenes from the play at the actual sites found in the dancical, I got to thinking: I gotta help her and anyone else who wants to track down these inspiring locations. So, thanks to Ms. Shields, here are some pictures of the sites as they were and are today (if they exist at all). The pictures will help remind you of what was once there and help you to identify the spot you're looking at today. If you use your device on the walk through Harlem, you can click links for added information. 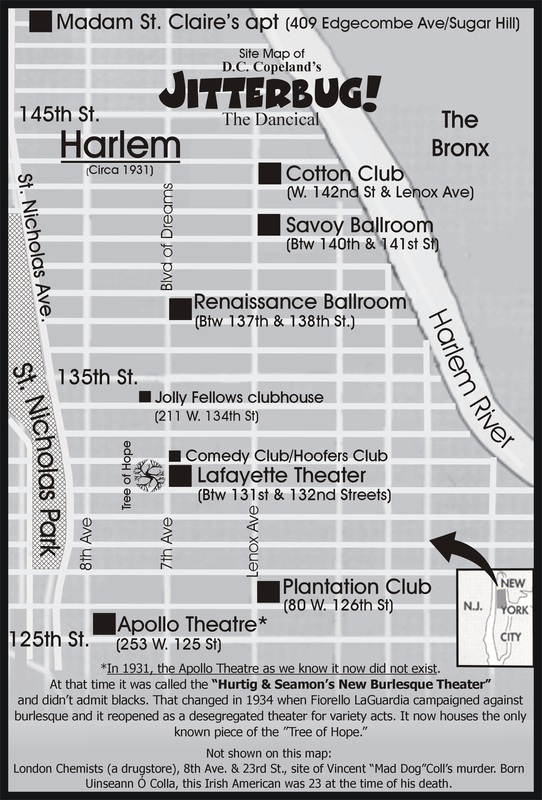 If Harlem isn't careful, it will soon become known as the "City of Markers" since many of the historic sites found in the play have disappeared; replaced by markers, monuments, and new buildings. It's a crying shame. With that in mind, we have created a photo assemblage of what was then and what is now of the sites on the map above in case anyone would like to journey back in time to walk the streets where legends were born. First off is the first of two buildings still standing and still being used as they were originally intended to be used in 1931, the year Jitterbug! ostensibly takes place. The rest are all gone, torn down by developers and speculators. These two buildings will serve as bookends on your journey. Back then it was the Hurtig & Seamon's New Burlesque Theater. Built in 1914, it was segregated until 1934. Although it is not included in the play, it's there because it holds the only remaining piece of the legendary "Tree of Hope" which every black entertainer patted on his or her way to a potential job with these words on their breath: "Hope to get a gig." Just as the dancical's hero Billy Rhythm does at the beginning of the play on his return to Harlem. ​Traveling northward from the Apollo, we come to where the Plantation Club once stood. This is where Billy Rhythm and Tharbis Jefferson-- on their first date-- see their Cotton Club boss overseeing the demolition of the rival Plantation Club which was about to open. The white gangsters boldly ransacked the place during the night, throwing everything out the front door into the street and then setting it on fire. Traveling northward, we come to where three legends once stood: the "Tree of Hope," the Lafayette Theater, and the Comedy Club. 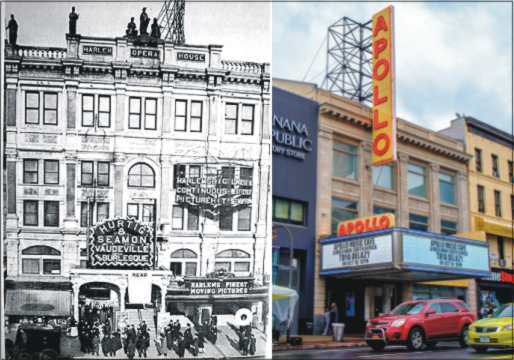 As you learned earlier, after the "Tree of Hope" was cut down for the widening of 7th Avenue, once known then as the "Boulevard of Dreams," the last remaining piece is on display at the Apollo. The tree use to stand in front of the Lafayette Theatre, the first New York theatre to desegregate (1912). In 1916 one of America's first black theatre companies was formed there. The Lafayette Players specialized in performing Broadway plays written by whites but performed by black actors. In 1936, Orson Welles staged Macbeth there. Although critics dismissed it as "Voodoo Macbeth," it was a major hit with over 10,000 people filling the street out front on opening night. The Comedy Club was next door. It served as a speakeasy and hangout for the Jolly Fellows to play cards, shoot pool, and gamble. Its small backroom-- just big enough for a beat-up upright piano hugging a wall and floor space to tap dance-- was known as the Hoofers Club. Jazz Dance's Marshall Stearns writes that it was the "unacknowledged headquarters" of American tap dance from the 1920s through the 40s. All the greats and wannabes would go there to practice their steps and to show off including Bojangles and Sammy Davis, Jr. Because the Jolly Fellows basically ran the place, they were by default, the gatemasters for the evolution of tap-- and swing since the gang's founder Herbert White introduced the world to the Lindy and later the Jitterbug through the many dance troupes he formed, including his first and most famous, "Whitey's Lindy Hoppers." Sadly, it's all gone now. Continuing northward we come to the Jolly Fellows official clubhouse at 211 W. 134th Street. It's interesting to note that as of February 2016, the former Jolly Fellows hangout is estimated by Zillow to be worth nearly $2 million dollars. The 2,400sf building has 3 units spread across 3-floors. Built in 1910, it is now owned by St. Stephens Baptist church across the street. You can learn more here. Continuing northward on 7th Ave, we come to where the Renaissance Ballroom once stood. Since Billy has been thrown out of the Jolly Fellows and can no longer dance at the Savoy Ballroom where Herbert White serves as its head bouncer, he and Tharbis have to dance at the smaller and less respected Rennie. It was torn down in 2015 to make room for a housing project. You can learn more about the Rennie and the fight to save it in this remarkable picture-filled story published by the Black Fives Foundation. 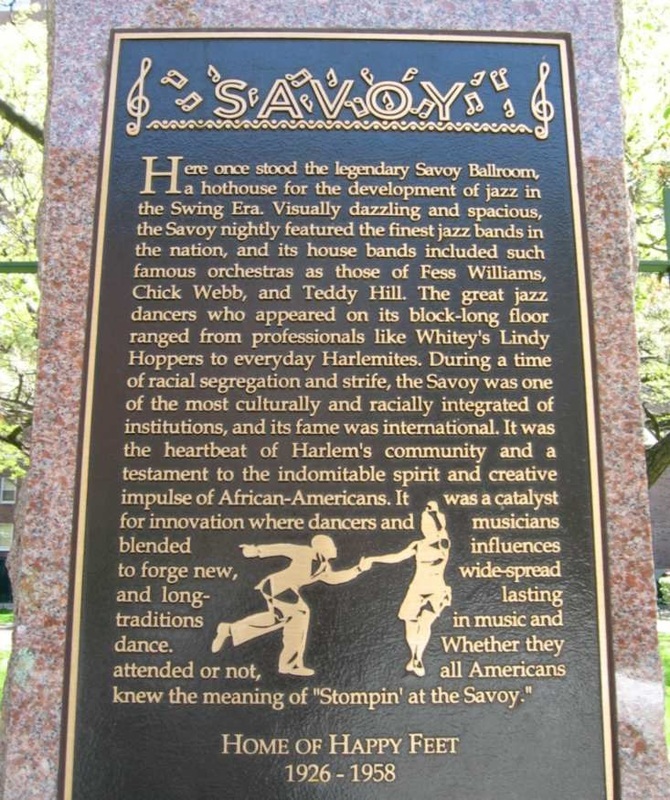 Turning east and walking a couple of blocks northward on Lenox Avenue, we come to where the most famous ballroom in the world once stood: the Savoy Ballroom, accent on the second syllable if you're a true hepcat. This is where the famous Cats' Corner once was, on a northeast section of the dance floor. Only the best dancers danced there, a place jealously guarded by the Jolly Fellows. 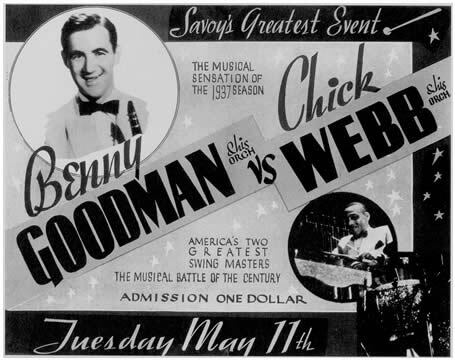 It's also where Chick Webb and Ella Fitzgerald held court as the house band and songstress from 1931 through 1942 (Webb died in 1939 but Ella, then 22-years-old, took over managing the band until 1942 when she left to focus on her rising singing career). This was also where a legendary battle of the bands between Webb and Gene Krupa took place. Krupa was the drummer for the Benny Goodman Band but he couldn't keep up with "Chicklet," the King of the Savoy. The only thing we have now of the Savoy is this plaque. 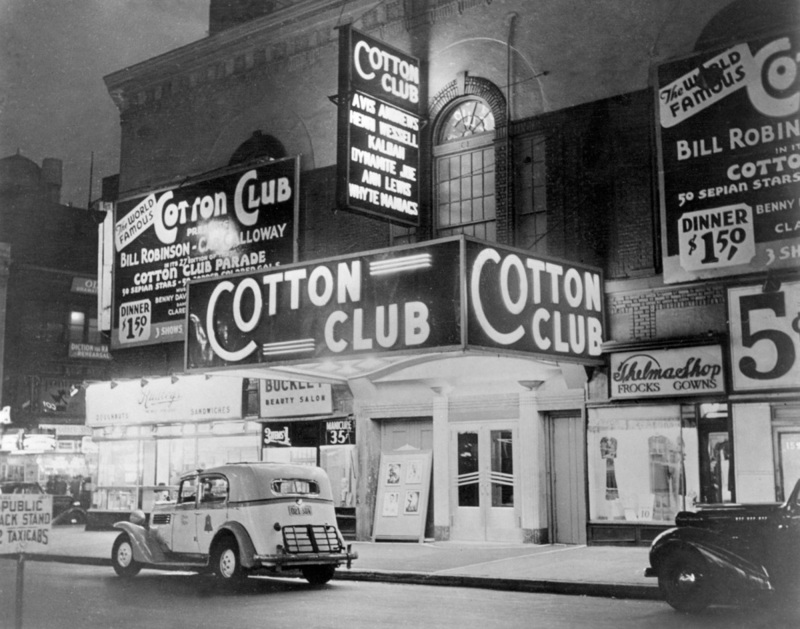 A short walk up Lenox brings you to where the original Cotton Club once stood and where much of Jitterbug! takes place. It's where we meet the gangsters who run the club and the talent that brings in the crowds such as Cab Calloway, just 22-years-old at the time of this story, and the 26-year-old Jewish songwriter Harold Arlen, the son of a cantor, who is churning out national hits from the club (a few years later he'll write the "Song of the Century": Somewhere Over The Rainbow). All we have now are memories and this address: 644 Lenox Ave. Finally in the most northern reaches of Harlem we can still see the original Sugar Hill building in the dancical located at 409 Edgecombe Avenue. 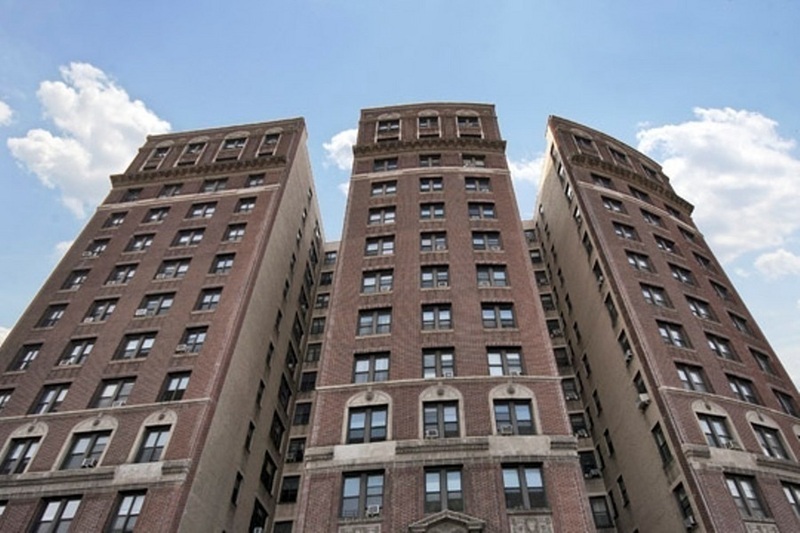 Opened in 1917 for a white clientele, by the 1930's this is where America's most wealthy and influential African Americans lived, including Madame Stephanie St. Clair, the bodacious and entrepreneurial numbers runner. 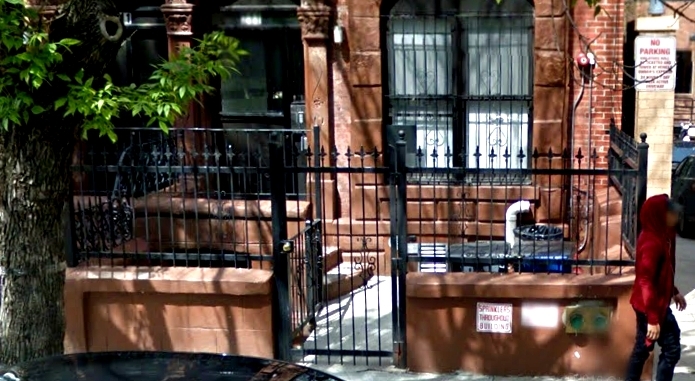 And where she is hunted down in the play by the Dutch Shultz mob who wanted to muscle in on her Harlem territory. It was also home for W.E.B DuBois; future-- and first African American-- Supreme Court Judge of the U.S., Thurgood Marshall, and many others. You can learn more here. The murder of Vincent "Mad Dog" Coll is part of the climatic ending of Jitterbug!s first act. 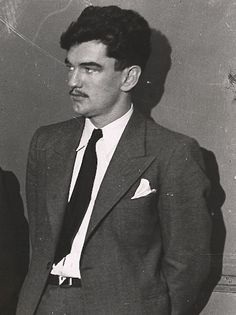 Born Uniseann Ó Colla, Coll was only 22-years-old when he was machine gunned while talking on the telephone in a phone booth inside the London Chemists drug store at 314 W. 23rd Street in New York City. 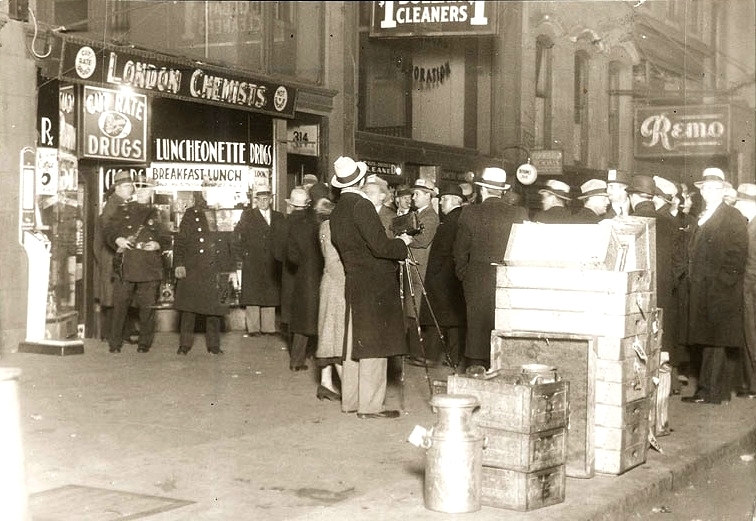 He was allegedly finalizing the ransom drop off with gangster Owney "The Killer" Madden (Owen Vincent Madden), owner of the Cotton Club where the dancical's hero and heroine Billy Rhythm and Tharbis Jefferson worked in the latest revue. Owney didn't like being blackmailed and he especially didn't like it when Coll kidnapped the manager of the Cotton Club, fellow gangster Big Frenchy Demange (who was expected to be at the club as its "token gangster" to thrill the rich, whites-only slumming clientele looking for excitement up in Harlem). Coll was demanding $35,000.00 (approximately $7,350,000 today). Even during the Depression and Prohibition, this was not an unreasonable sum for Madden who was making money hand over fist at the club and other speakeasies he owned selling his private label "Madden's No. 1" beer as an entry label to the harder and more expensive domestic hootch and the international spirits smuggled into his clubs from Canada. He also made a pretty killing by charging hefty corkage fees for opening and serving those clubgoers who brought their own bottles of the harder stuff. Coll's road to an early death began a few months before when he tried to hijack beer trucks he was paid to protect by his employer, gangster Dutch Schultz. Dutch retaliated by killing Coll's younger brother. 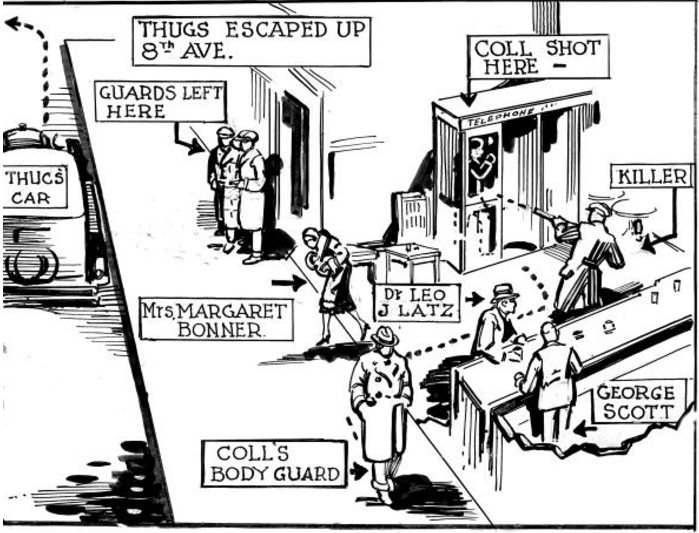 Coll responds by gathering up his gang of killers and randomly machine guns a social hall where Schultz and his henchmen were known to hang out. Unfortunately, five kids were shot and one, five-year-old Michael Vengalli, was killed. You can watch an archival newsreel of that child's funeral here. New York mayor Jimmy Walker called Coll a "mad dog," an epithet that chased him the rest of his short life but "lives in infamy" forever. BTW, Coll was acquitted thanks to a famous and expensive lawyer named Samuel Leibowitz. For a more detailed account, please click here. 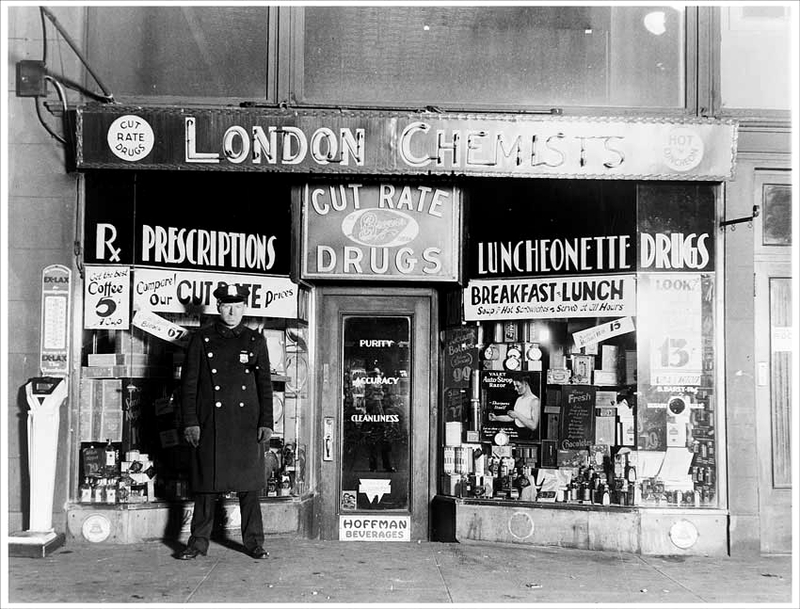 Today the London Chemists is long gone. In its place is a Petland Discounts store. Aside from the address, it can be identified by two of the few remaining signs from the past. The first is the business next door to the original London Chemists: a dry cleaners. This isn't all that unusual when an original owner retires and sells his thriving business to someone else. 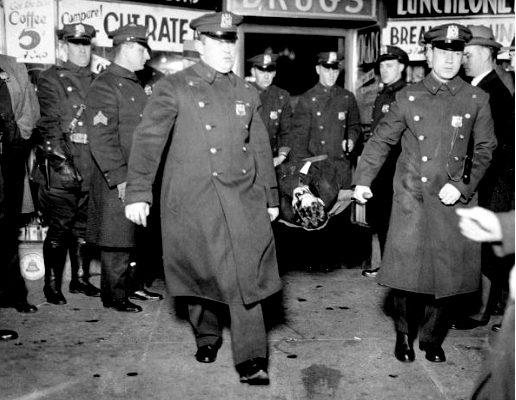 Finally, we leave you with this final photo of Coll's body being brought out of the pharmacy. ​ ​“How many shots were fired is not known. Some witnesses said fifteen, others said fifty.